It was overcast and 5 degrees with occasional light drizzle. Parking is available on Hathor Crescent just before Rowntree Mills Road descends the hill to the river. The road is closed at the bottom of the hill and from here the bridge across the Humber river can be seen. The bridge is a steel girder construction and has been fitted with new wood decking to convert it into a safe pedestrian bridge. It’s construction likely dates to around 1900. The bridge can be seen crossing the river in the lower corner of the cover photo, which is an aerial shot from 1953. 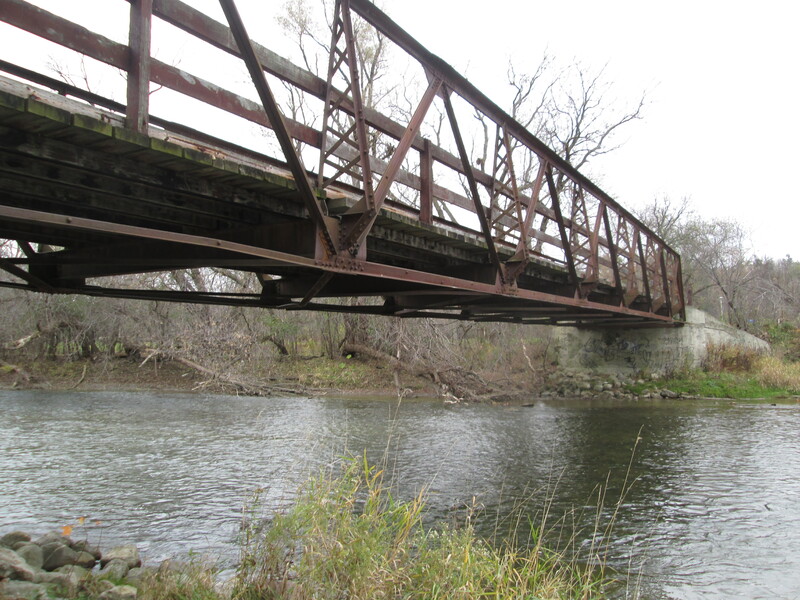 The photo below of the bridge is taken from the west bank of the river. 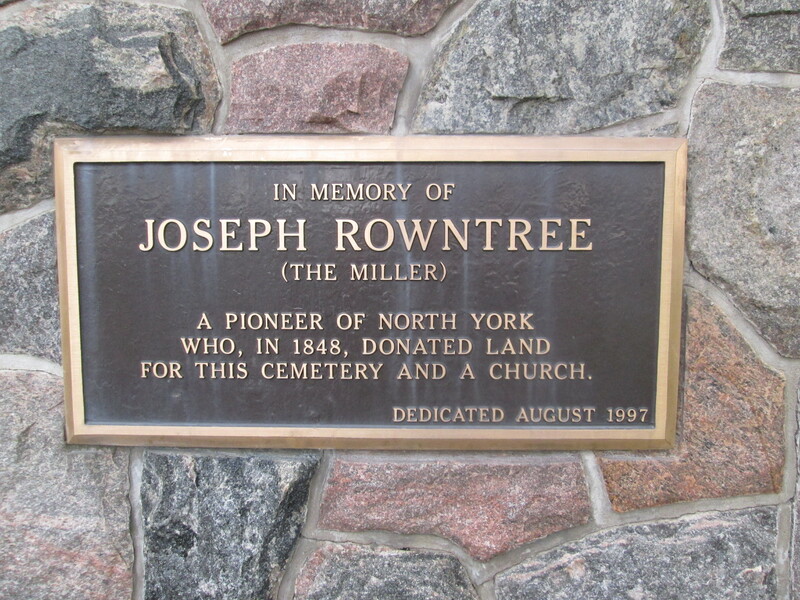 Joseph Rowntree arrived in Canada from England in 1830 and set himself up in an area known as Pine Ridge, just outside of Thistletown. In 1843 he built a saw mill on the east side of the Humber river and in 1848 he built a grist mill on the west side. A road was built to access the mill which we now call Rowntree Mills road. A bridge was built across the river and he named it all Greenholme Mills. In 1870 Joseph added the Humberwood Mills, a mile down river, to the family holdings. The cover photo shows the grist mill as it appeared in 1953. Rowntree Mills road crosses the bridge and passes to the west of the mill. A laneway completes the loop on the river side of the mill. Today the area where the mill stood 60 years ago has become completely overgrown. 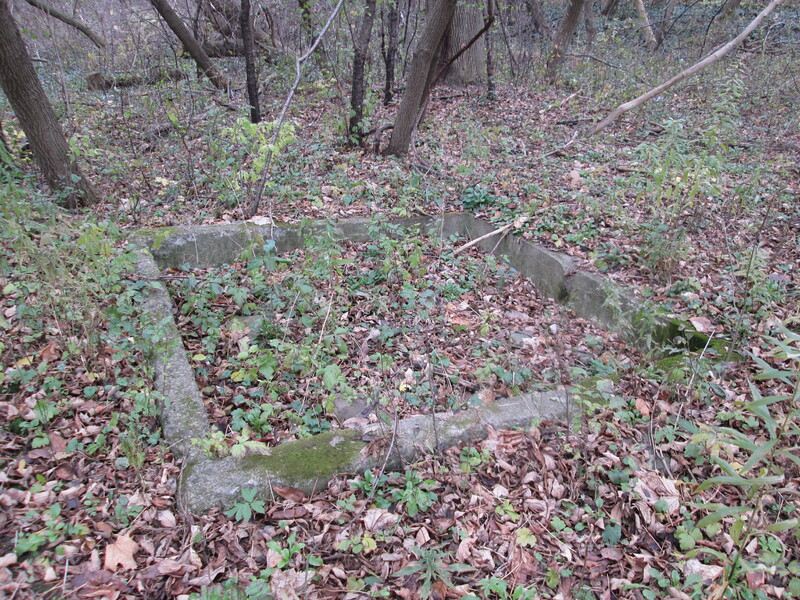 All that could be found was this square area of concrete in the woods and many piles of bricks, stone and concrete. From the east side of the river the former mill site can be identified by the row of pine trees that ran along side of the lane way that lies between the mill and the river. They show up as the dark strip to the right of the road, adjacent to the mill, in the cover photo. I can picture Joseph planting these pines along the ridge in honour of the community of Pine Ridge where he lived. The mill stood about 20 feet above the current water level of the river. It isn’t immediately obvious how Joseph used the water power from the river to turn the grinding wheels in his grist mill. It may have initially been an undershot wheel sticking out into the river. It was a morning full of various birds. At one point a migration of cardinals passed through but none sat still long enough to get their picture taken. There were also flickers, herons, and large birds of prey. 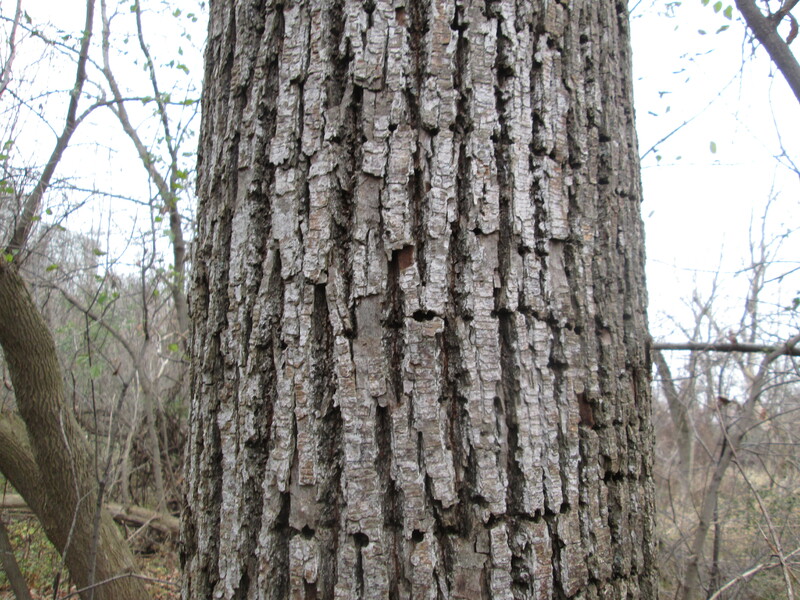 Some of the trees in the area display the straight rows of tiny holes that are typical of a yellow-bellied sap sucker. These woodpeckers drill little holes from which they feed on the sap that flows out. The tree in the picture below had these rows of holes extending for as far up the tree as the eye can see. 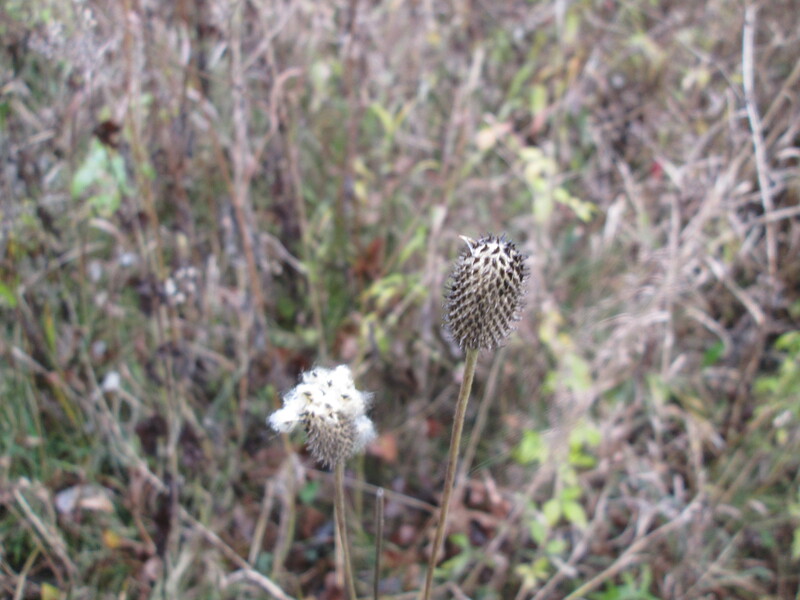 This plant is known as tall thimbleweed. The single head on a tall stem contains tiny nubs that make it look like a thimble. When the seed heads burst open they look and feel like cotton. Native peoples used the plants for medicinal purposes but we now know that the leaves are toxic in large doses and so the plant is used mainly for decoration. The picture below shows both a closed pod and one that has blown open to spread its seeds to the wind. 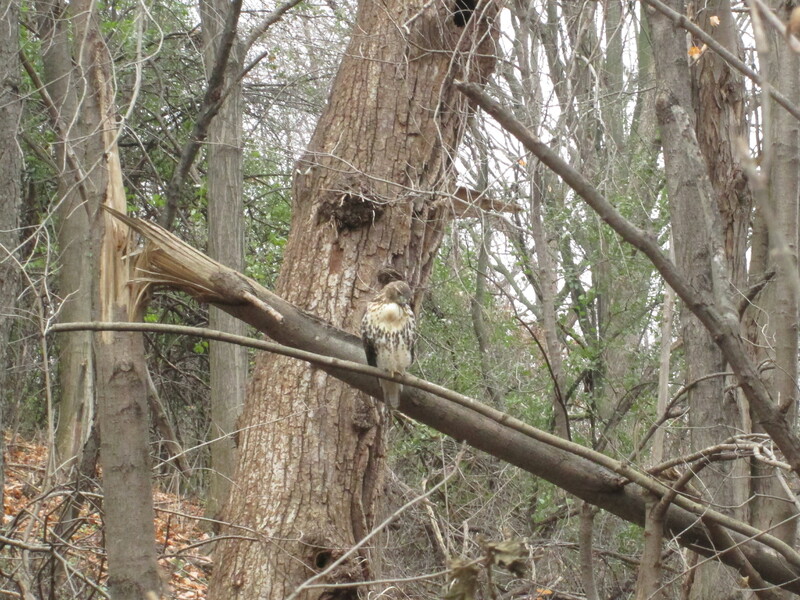 This very large red tailed hawk didn’t seem to mind posing for the camera. 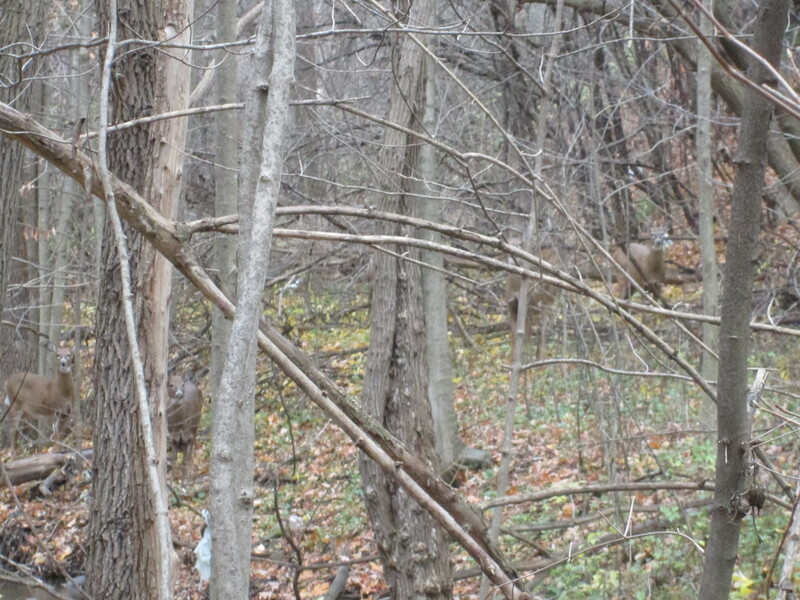 Rowntree Mills Park and the surrounding ravines have been taken over by white tail deer. In one spot I was able to see 8 females at one time plus at least one male. Mating season is known as rutting season for these deer. Males begin their part of the rut in the fall when the velvet is falling off of their antlers. In North America this lasts for several weeks with the peak being on average, November 13th. The male’s part in the reproductive act lasts for exactly one thrust. Ho-Hum. Females go into rut for periods of up to 3 days at a time and can do so 7 times over the rutting season, or until they conceive. The picture below has at least 4 deer looking at the camera plus 4 others hiding in the background. In October 1954 the area on the east bank of the river just north of Rowntree Mills road was home to a small community of houses. On the morning of October 16, 1954, there were 12 less of them there because Hurricane Hazel had swept them away. Two people died in this area as well when they were trapped in their car as the river washed it down stream. Today the area has been cleaned up and there is no trace, other than in old aerial photos, to show where the homes were. Rowntree Mills Park was named after Joseph in 1969 but was closed in 2009 due to wild parties that trashed the park. 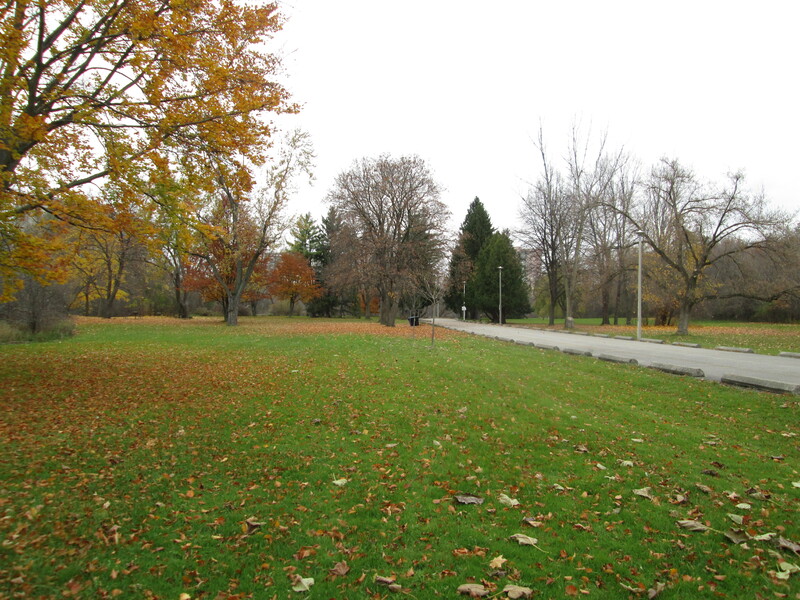 Today it is basically abandoned although the grass is cut and the leaves are cleaned up. The picture below is taken from the front yard of one of these former homes looking along the street where others once stood. At the corner of Rowntree Mills Road and Islington Avenue is a pioneer cemetery. This land was donated in 1848 by Joseph Rowntree to be used for Pine Ridge Methodist Church and its cemetery. There are many grave markers in here that commemorate the lives of various members of the Rowntree family. Although it seems likely that Joesph was laid to rest here, I was unable to locate his grave marker. 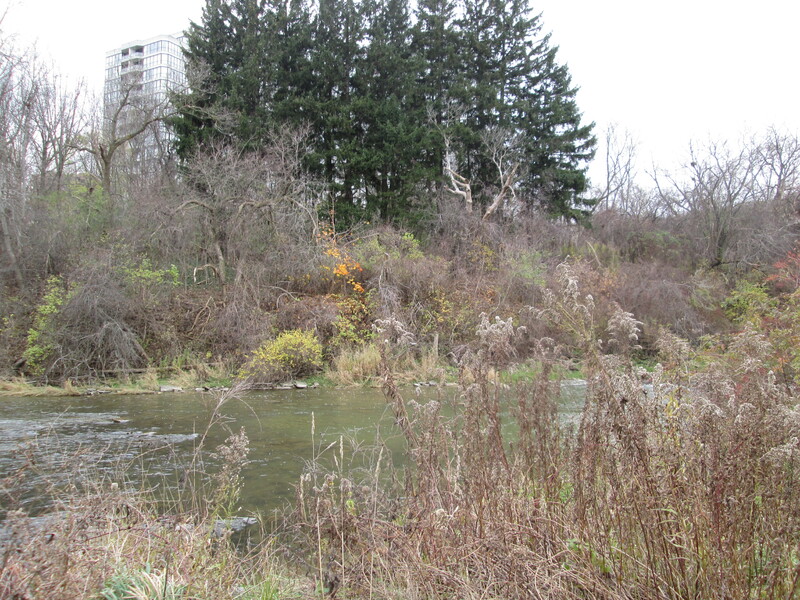 This entry was posted in Humber River and tagged Humber River, hurricane hazel, Red Tailed Hawk, rowntree mills, Thimbleweed, thistletown, White Tail Deer, yellow bellied sap sucker on November 10, 2014 by hikingthegta.